If you’ve ever thought about doing affiliate marketing, Amazon Affiliate is a great place to start. Many of you might not know this, but Amazon actually started with affiliate marketing when they first began operations in 1995. Jeff Bezos was operating Amazon as an online book retailer and had a very limited marketing budget. To solve this problem, he introduced the Amazon Associates program that gives a commission to every referral to Amazon that converted into a sale. It was a fantastic solution that’s cost-effective for the brand while opening an opportunity for people to make money online. 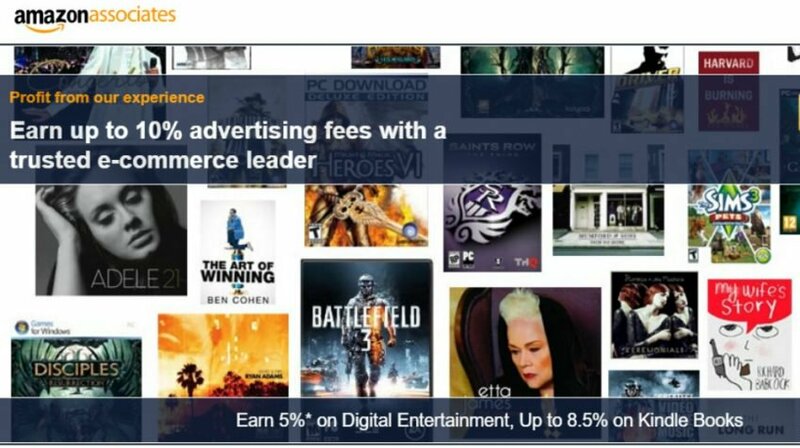 Fast forward to today, Amazon Associates enables nearly anyone with a laptop and an internet connection to make profits online through promoting millions of new and used Amazon products. Amazon vs. Clickbank: Which is a better affiliate marketing partner? Amazon Affiliate (also known as the Amazon Associates program) is a referral program where you will be compensated for sending traffic from your website to Amazon that converts into a sale. Once the referrer makes a purchase, you will be paid a commission of a certain percentage from the item’s sale price. Note: Amazon Affiliate (where commissions are made based on referrals to Amazon.com that converts to a sale) shouldn’t be confused with Amazon sellers or Amazon FBA operators (where individuals or companies open an Amazon store to sell products on Amazon.com). When visitors on your website clicks an Amazon referral link, they will land on Amazon.com with a cookie which lasts for 24 hours. If they make any purchase on the platform within 24 hours, you’ll be paid a fee based on the commission bracket of the item. But if they purchase after the first 24 hours, you won’t be paid a fee. There is also a list of strict terms and conditions that you need to adhere to to be a verified Amazon Associate member and get paid commissions. If you’re found to contravene any of their guidelines, you’ll risk your account being suspended or banned. Affiliate marketing is by no means a get rich scheme. Behind the many affiliate marketing success stories you might’ve come across on YouTube or popular marketing blogs, it actually involves a lot of work. Before you get started as an Amazon Associate and get into affiliate marketing, you need to have a place to redirect clicks to Amazon. And where might that be? Well, a website of course! Getting traffic to your website takes a lot of effort, but you’ll find that converting those traffic to sales on Amazon is a different ball-game altogether. Though when it’s done right, you might be surprised at the amount of passive income you can get as an Amazon Associate. Before you get started with Amazon affiliate marketing, you need a website that attracts a healthy amount of targetted traffic. You’ll need to pour in a lot of time to build, manage, and create great content on your website. Don’t just focus on review-based content. Instead, try to provide something of value to your readers. Don’t create informational articles. DIY or “how to” articles rarely convert into sales. Spend time optimizing your articles for search engine optimization (SEO). But don’t forget to do off-page SEO optimization as well, especially getting quality backlinks. Do keyword research. Lots of it and for all your articles. Then, create articles out of the relevant, high-volume keywords that you find. Create both evergreen and trending articles to ensure they perform well (both short term and long term) on search. Improve and refresh your old content. Already have content on your website? Revamp, edit and refresh your old content. Try Brian Deen’s skyscraper content technique. TLDR: Make your content 10x better than other similar content out there. Getting traffic will not be easy and may take months before you get a decent amount of organic visits to your site. But it’ll be well worth it in the long run. You’ll see why in the next segment of this article. Create an Amazon account (if you don’t already have one). 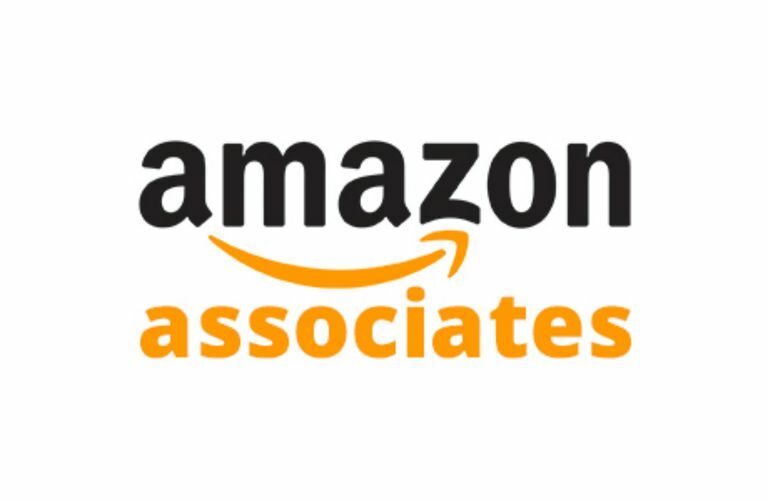 Visit the Amazon Associates homepage. You’ll be prompted to log into your Amazon account, just click Login. Step 1: Enter your details in Account Information. You can either use your primary Amazon account address or enter a new one. 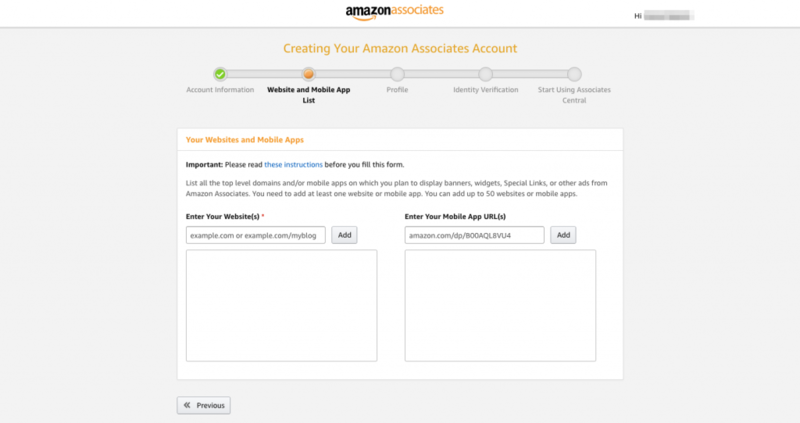 Step 2: Key in your website and/or mobile app URLs where you’ll be promoting your Amazon affiliate links. 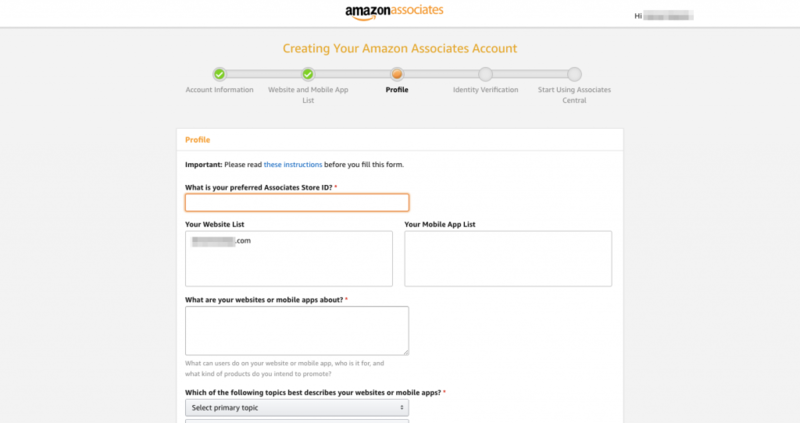 Step 3: Start by entering your choice of Associates Store ID, then fill out the rest of the page’s form regarding the details of your profile, website, content category, and others. Be honest and make sure to fill every section. 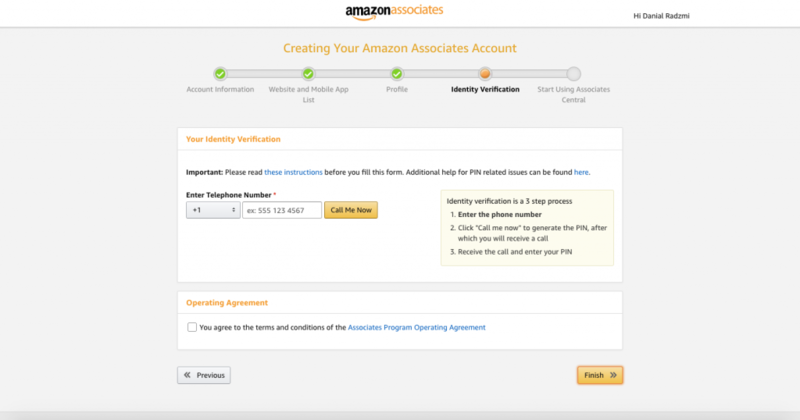 Step 4: Before you can start using your Amazon Associates account, you’ll need to verify your identity. It works similar to most other company’s Know Your Customer (KYC) policies, and it’s an extremely important step. But don’t worry, it’s pretty quick and easy to settle. 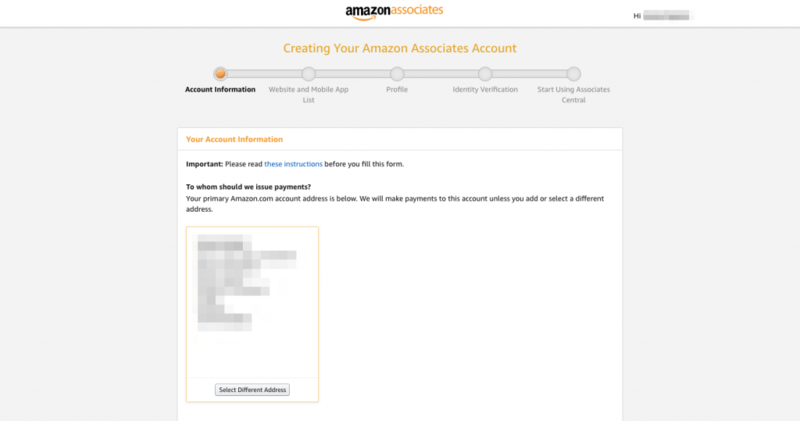 Once you’ve successfully created your Amazon Associates account, you’ll arrive at your personal Amazon Associates dashboard where you’ll be asked to create your Amazon affiliate links. 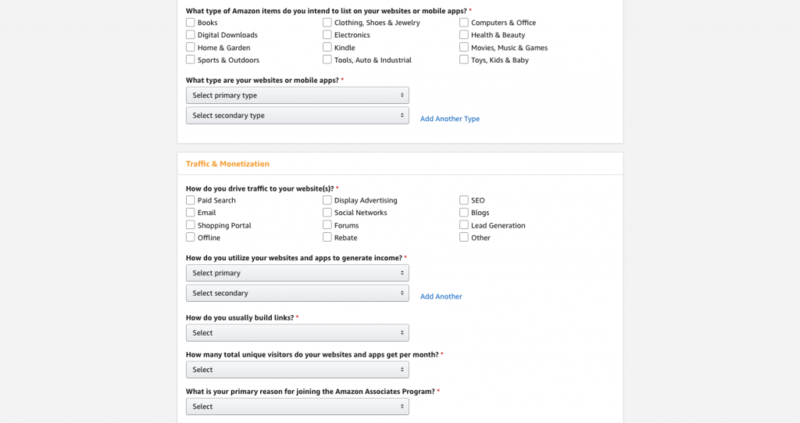 These are the links that you’ll be using on your website to drive traffic to Amazon. If you have a newly created Amazon Affiliate account, you’ll need to make at least one sale within the first 180 days (which used to be 90 days). Failing which will lead to your account getting banned. If you ever find yourself in that unfortunate situation, fret not! You can reapply, and you’ll receive a new Amazon Affiliate ID. The best way to avoid from getting banned by Amazon due to account inactivity is to make sure that your website already has a good amount of traffic. That way you can focus on optimizing past articles and creating new content with the end-goal of motivating your site visitors to click on your Amazon affiliate links. 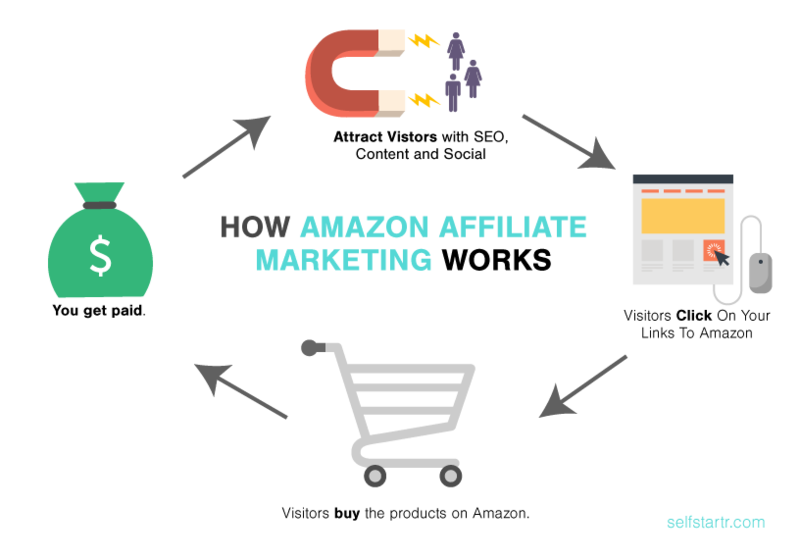 Once you have created your Amazon Associate account, the last step before you can officially start affiliate marketing with Amazon is to create your very own Amazon affiliate links. Once you find a suitable product, click the “Get Link” button. Choose to customize your links with text only, text and image, image only, or widget (you can also customize background color, title, color, and image size depending on the type of link). Preview of the link before adding it to your site. Copy and paste the link, Amazon short link, or HTML copy and insert it on your site. Insert the Amazon links to your relevant articles, and you’re ready to go! Since Amazon is very strict with how Amazon Associates use and promote their links, make sure you read their terms and conditions from start to finish. The last thing you want is to put your account in jeopardy of being banned. Whether you’re new to affiliate marketing or been around the space, you might’ve heard of Clickbank. There are many affiliate marketing programs out there, but Clickbank is by far one of the biggest and most popular among all. It’s hard to say which is better and trickier to tell which program can help you make more money online. Either way, you’ll need to compare its pros and cons to see which is more suitable for you. But more importantly, you’ll need to do your due diligence and decide which programs carry products that are more popular and available to a broader demographic. Clickbank is incredibly popular and for a good reason. They offer a wide variety of products with large commissions that can range anywhere between 10% to well over 50%. On top of that, there are also subscription-based products where you’ll be able to earn recurring commissions from regular paying subscribers. Although Clickbank is a favorite among many veteran affiliate marketers, their products are nowhere as popular or sought-after among consumers as those found on Amazon. On the other hand, Amazon has spent a lot of resources that have turned the marketplace to become a customer converting beast. Every aspect of the platform has been fine-tuned to entice and encourage casual visitors to make impulse purchases. And make them keep coming back. If there’s one drawback about Amazon Associates program is that they offer notoriously low commissions. Depending on the product category, it can range anywhere between 4% to 10%. They also have a relatively short cookie span. 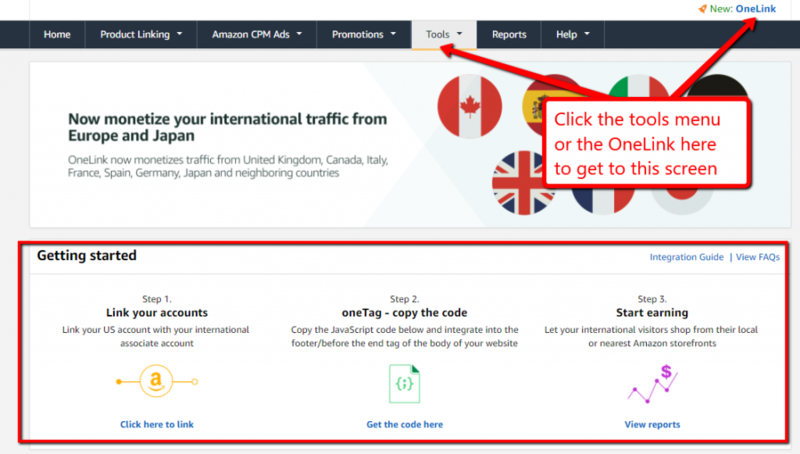 For example, if a visitor clicks on your Amazon affiliate link for a product worth US$100 and makes a purchase within 24 hours, you’ll receive a commission of US$4. By itself, that sounds pretty low, doesn’t it? 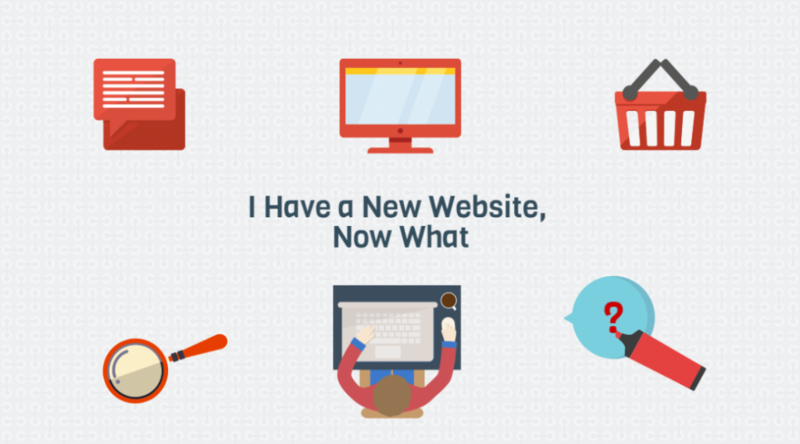 But what if you’re running a website with over 100,000 visitors per month? If you’re able to convert 1% of your visitors to potential purchases, that amounts to 100 people. Say, from the 100 people, only 10% clicks on the Amazon affiliate link of a product. And from that 10% (or 10 people), only 50% purchases that product on Amazon. Let’s say the product costs US$50. Since 5 people bought that particular product, the total amounts to US$250. If the commission for that product is 4%, you have made a cool US$10 from a single product in a month. But if they add more to their cart and check-out within 24 hours, you stand to make even more commission. Is 4% commission per product enough? US$10 per product per month in commission might not sound like much. But remember, that’s a conservative estimate of 1 product bought by 5 people in one day. If that same product gets bought by 5 people for 10 days out of an entire month, that’s US$100 per product per month. If you have at least 10 products and with similar conversion rates, that’s at least US$1,000 in commissions every month. It may not be life-changing money, but it sure is a great passive income for a side gig. And if you go at it full-time, who knows, you might even manage to pull in US$5,000, US$10,000 month in month out! Note: This is only a simulated, conservative estimate. Since commissions can reach as high as 10%, the products you choose to promote will ultimately influence your potential commission income. When comparing Amazon vs. Clickbank, other than the differences in commission rate, another factor jumps out the most. And that is brand recognition. Amazon has cemented itself as one of the modern day’s most successful companies and boasts the largest and most active online marketplace in the world. Aside from the high level of trust among consumers, Amazon also has great customer service. These are the kind of factors that often determine whether a casual visitor converts to a paying customer. And if you’re doing affiliate marketing, that “last mile” experience can go a long way. Okay, so you’ve built a website, created content, signed up for Amazon Associates, and you’ve gotten your Amazon affiliate links. Now what? Most affiliate marketers enter the industry with a shoe-string budget. And it’ll most likely be the same for you. You might hardly have any budget for marketing. That means the only (and often best) way to grow your website is to optimize it for Google search. SEO is a long game. But once your site has great on-page and off-page SEO, it’ll be able to attract more organic clicks and visitors over time. The more visitors you get, the higher the likelihood of your Amazon affiliate links being clicked. Find the search intent of your target audience. Select relevant, high-volume and long tail keywords. Build content based on your targetted keywords. 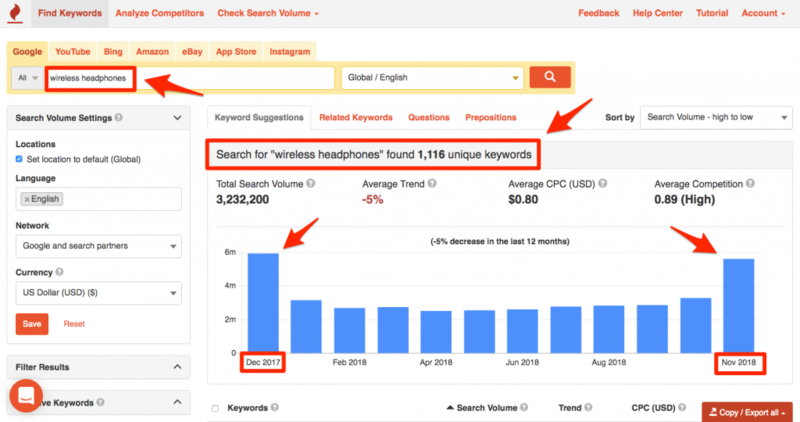 Note: If you’re unsure about how to do good keyword research (or what it even means), read this detailed article to get you started. 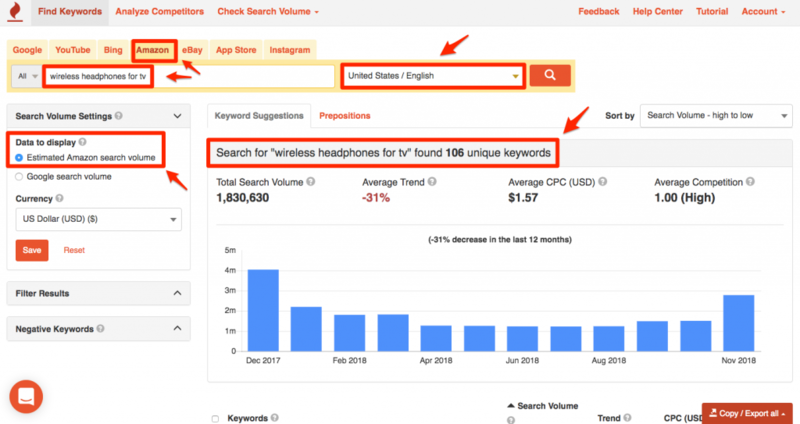 From your keyword research, you should be able to get a good idea of your target audience’s search intent (i.e., how they search for the products that you plan to feature), keyword volumes and trends (how popular are the keywords related to your product), and long tail keywords. Since you’re working on what is essentially an affiliate marketing website, conversion is your end goal. Which means to get the right type of targeted visitors to your website (and convert them), you should use as many relevant long tail keywords as possible. So, as you can see, SEO for affiliate marketing is not just about pulling in a lot of visitors and clicks. It’s about attracting the right type of audience to your website. Find suitable long tail keywords with higher conversion potential to include in your content. Get a long list of content ideas based on high-volume search terms. Learn about search trends of various keywords related to your niche. For example, if you’re running a men’s lifestyle website, it might be a good idea to feature a gadget review and comparison section. It’s an ideal place to insert and promote your Amazon affiliate links. To get started, pick a product type like “wireless headphones,” type into the search bar in KeywordTool.io, and press enter. Apple vs Sony: Which has better wireless headphones? This is just from one keyword search and one results page from KeywordTool.io. Imagine how many more relevant content you can create when you do regular keyword research on your niche of choice. Now, from this list of keywords, you will see some great long tail keywords. 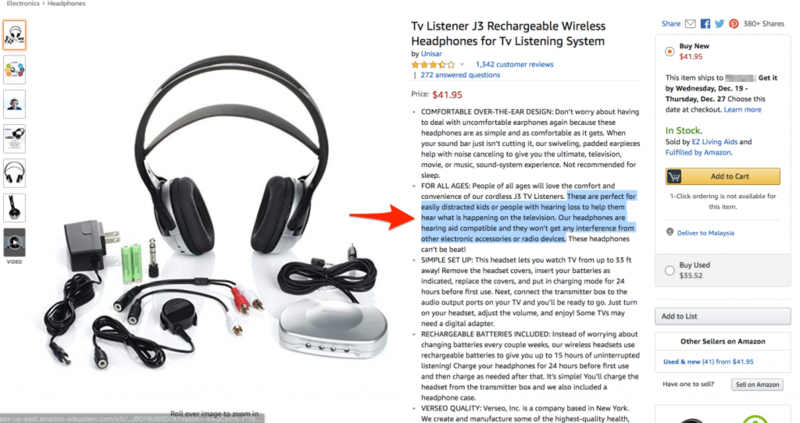 We’ve chosen to highlight “wireless headphones for tv for hard of hearing” due to its very specific nature. Long tail keywords such as those are interesting, especially for affiliate marketers, because people who search for long tail keywords have a specific intent. More often than not, it’s with a potential purchase in mind. 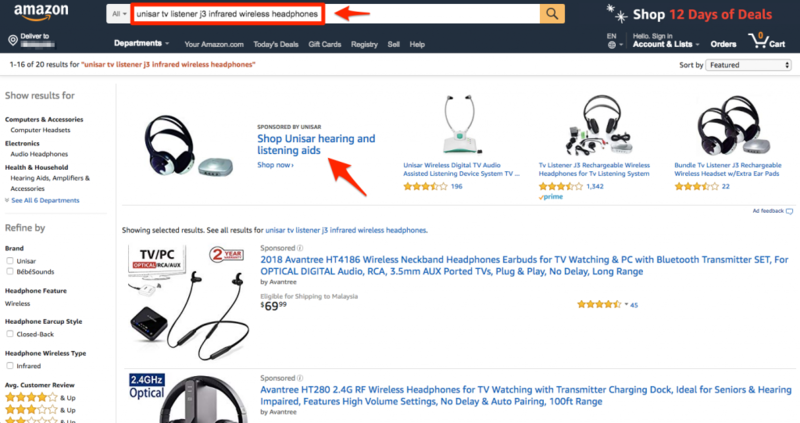 There may not be many websites that rank well for wireless headphones for people with hearing problems. If you’re able to rank your article with Amazon affiliate links for that keyword, you’ll be ahead of the pack. And this is only one example out of many, many more than you can experiment with. 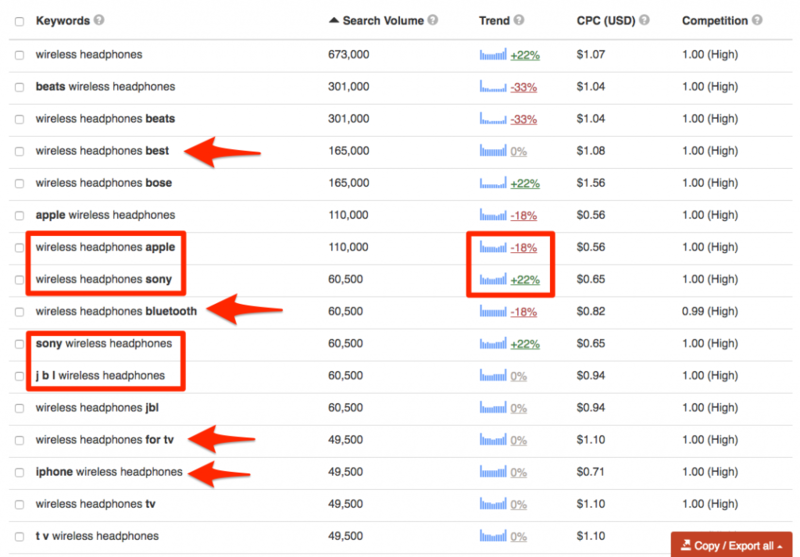 Don’t be alarmed by the relatively low search volume of long tail keywords such as those. There may be fewer people searching for those types of keywords, but they boast a far better conversion rate. The key to increasing your Amazon affiliate earning potential is to promote products that have a lot of demand. That comes from understanding the keyword search and hence the buying habits of consumers on Amazon, including seasonal and shopping trends. A simple keyword search on Google won’t cut it. Instead, you’ll be better off using KeywordTool for Amazon. The tool pulls autocomplete data from Amazon itself and shows a long list of keywords that are related to the product you’re targeting. 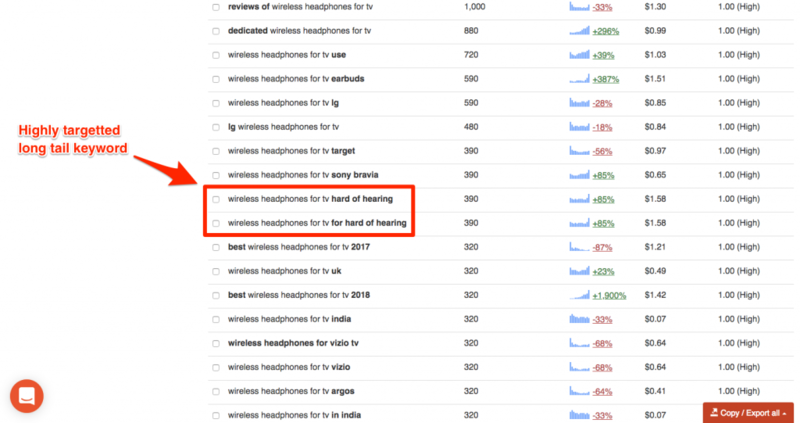 From the results, you can see that there are 106 unique keywords related to “wireless headphones for tv.” Although there’s a visible decrease in trend for the past 12 months, it is by no means an indication of the product’s overall popularity. From the trend chart, you’ll see that there are at least 2 million related keyword searches in November and a high of 4 million in December. These two search terms show that there is a good amount of interest for that particular type of product, including a huge rise in searches from October to November 2018. 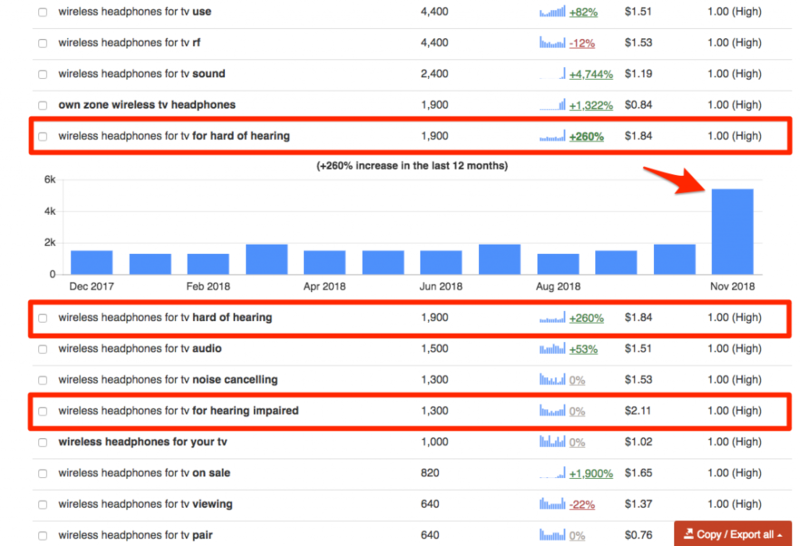 From this simple research on consumer behavior on Amazon, you can safely say that there is a healthy demand for wireless headphones for people with hearing problems in both Google and Amazon. Which makes this an ideal product for Amazon affiliate marketing. You can use the methods laid out in this guide and apply it to your affiliate marketing plan. Replicate them for all the products and niches that you’d like to target. Trust that it will make a big difference in your Amazon affiliate work. Amazon Associate is an amazing program. It has its pros and cons, no doubt, but it’s arguably one of the best affiliate marketing partners for just about anyone. Especially if you’re still new to this industry and entering with a low budget. Draft out a plan, don’t rush into it (nor should you take too long finding the perfect plan), and put in some elbow grease into research. And get a good keyword tool. Get prepared for the long haul because there’s no such thing as an affiliate overnight success. If you do it well and persevere, who knows, you might just be the next affiliate marketing success story.